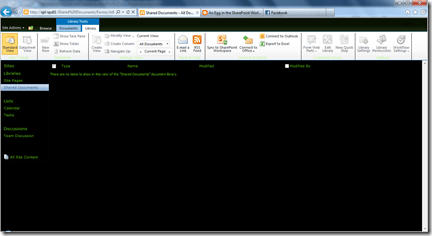 Ribbon is introduced in SharePoint 2010. We can easily make customization it by using the Feature Infrastructure. For example, we can create a new button, delete an existing button, as well as replacing an existing button. Hence I can easily get around with the problem that I had in SharePoint 2007. Once you have created the above xml files…you will need to copy them to a folder called DisableRibbonButton in the Features folder in the 14 hive. After that, go to any document library in your site, click the “Library” tab at the top and you should see the “Open with Explorer” button is now disappeared from the Ribbon.